Well done to the children who took part in the Harrogate Christmas Concert on Saturday 15thDecember. The children joined with schools from across Harrogate and Knaresborough to perform a selection of Christmas songs, whilst accompanied by the Harrogate Choral Society and a full orchestra! The concert was absolutely sensational. The performance of “Walking In The Air” gave Mr Hirst goosebumps! A massive thank you to all the school staff and parents who helped out throughout the event. Special thanks to Mr Babington and Mrs Hunter (Joseph’s mum), who did the majority of the rehearsals and organisation of the event. Everyone in school produced an amazing selection of artwork which was sold to parents. All the money raised went to Children in Need. Today we made hand puppets with Miss Levine and Mrs Dodson. We designed them, cut out felt clothes and facial features then sewed everything together. During the afternoon we wrote and performed a puppet show. Everyone was absolutely brilliant, well done! We were illustrators today! 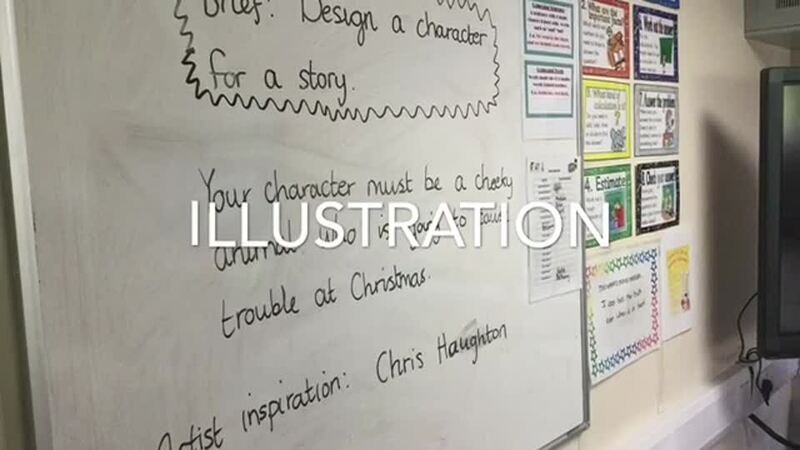 We all had a fun day with Miss Carruthers and Mrs Grannon, learning to illustrate in the style of Chris Haughton. We designed our own characters and developed our ideas over the course of the morning. In the afternoon, we created our characters in the style of Chris Haughton out of paper. Check out the video and photo slide to see our day and our incredible characters! Miss Carruthers and Mrs Grannon were very impressed and everyone had lots of fun! Leeds Rhinos have run a Rugby Club for KS1 this half term. It has been lots of fun! Skipping school visited Crossley Street today, it was lots of fun and each year group learnt a different set of skills and games, which everyone got to show off at the end of the day! We can't wait to use our new equipment at playtime now! Sandford had a fantastic day at The Countryside Day. We took part in lots of different workshops including orienteering, mini-beast hunting, Go Get Riding and pizza making. Here are a few pictures showing what a great time we had! The circus came to Crossley Street this week! The whole school enjoyed an entertaining assembly and learnt circus skills throughout the day. It was lots of fun! Year 3 children were given the opportunity to put their needle and thread skills to the test during the Spring Term. They all agreed that re-threading those needles was the most challenging part! The children learnt several yoga poses and tried really hard to join in and give them all a go. We have just finished our incredible International Day, where the children have, in their house teams, visited 5 countries from across the globe: Russia, Mexico, Australia, Japan and Senegal. They have sampled food from each of the countries and had a go at some traditional practices, including Japanese writing, African drumming, creating Faberge eggs, Aboriginal boomerang art and making Mexican mirrors. It was wonderful to see the children having such a great day, whilst learning about the cultures and traditions of the countries they visited. Everybody had their own passport, which was stamped in each country. Vegemite. Are you a lover or a hater? Sanford enjoyed learning all about meditation and skills they can use to help them relax and calm their minds! On the final day we made dream catchers, they looked amazing! It may have been a week late due to the snow and it may have snowed really heavily again on the rescheduled date, but that didn't stop our children (and parents) putting in an amazing effort for this fun day at school! The costumes and ideas were fantastic, so well done everyone! Despite the snow disrupting our planned 'World Book Day', school was open on Friday and lots of the children brought in the most amazing potatoes, which they'd made to look like book characters. The creativity was fantastic! So many different ideas! Thank you so much to everyone who took part. Years 1, 2 and 3 have been taking part in weekly Rugby lessons with Vila, our Leeds Rhinos coach, who has also been running a lunchtime club for children in Years 4, 5 and 6. The children have learned a range of different skills and some of them are well on their way to becoming very accomplished Rugby players. Keep up the hard work everyone! Children from Year 4 and 5 have had great fun at Lego Club. They have created amazing structures and completed some tricky challenges. Can you spot the blindfold challenge in the photos? Touch typing is an exciting new after school club for upper Key Stage 2 children. On Saturday 8th October, Mr Hirst completed his skydive from 10,000 feet over Bridlington and the East coast to raise money for Action for Pulmonary Fibrosis. A HUGE thank you to everybody who supported his fundraising, helping him to raise £782.48! !